Despite my “insider” status, there wasn’t a dealership in town allowing even brief test drives – Not because of any particular concern for my well-documented penchant for high-speed shenanigans, but because every car arriving in Phoenix was already spoken for. Aside from our Guest Editor’s Altima Coupe test drive at Nissan’s Testing Grounds in Tennessee, I was one of the first in Arizona afforded the opportunity to drive the 2008 Nissan Altima Coupe. The Altima Coupe 3.5 SE that I drove actually looks vastly different from the Altima Sedan (which is a handsome car in its own right), and the sporty look of the car is certain to turn heads.Believe it or not, it’s VERY similar in size to the Altima Sedan.This car looks WAY better in person, where you can appreciate the depth of the shape and the refinement in the design – these characteristics simply don’t translate well onto paper. The rear of the car is incredibly attractive, with a bold character line that spears forward, giving the impression of coiled energy. The lights on the rear are nice and the rear back up lights (clear) create a break in the big red rear lights. Thankfully, Nissan opted to do away with the clear “Altezza”-style lights for the Coupe, and it’s a welcome decision.The dual exhausts, while avoided as too “boy racer” by the frumpy pencil-necks at Lexus and the primadonnas struggling to design an attractive BMW, are quite handsome.In fact, they’ve become more of a Nissan signature than the L-shaped headlights or the catamaran fender treatment. 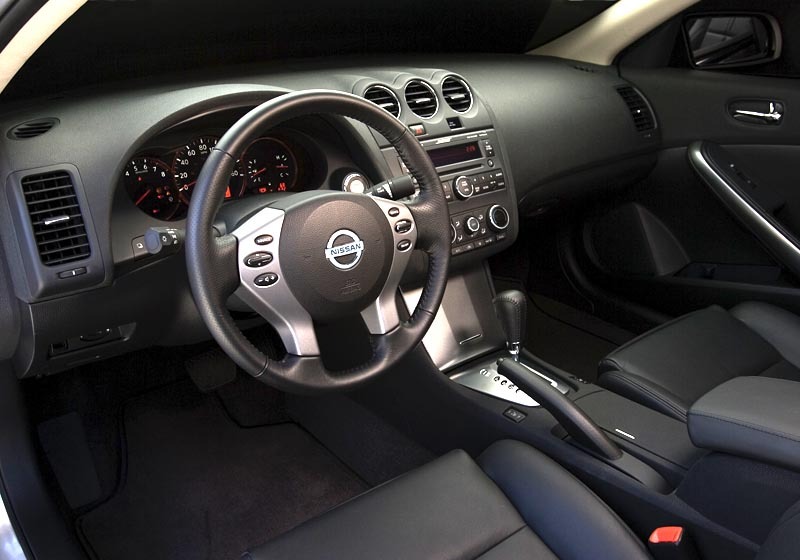 In what has become typical of Nissan and Infiniti design, the front seats are moderately narrow, and may not be comfortable during long drives for anyone over 200 lbs.The front cabin area feels airy and roomy, partly due to narrowed and lowered door sills, and narrower A-pillars than either the G35 Coupe or the Altima Sedan.Rear seat room is similar to the G35 Coupe, but entry and egress seem a bit easier, possibly due to redesigned front seats. 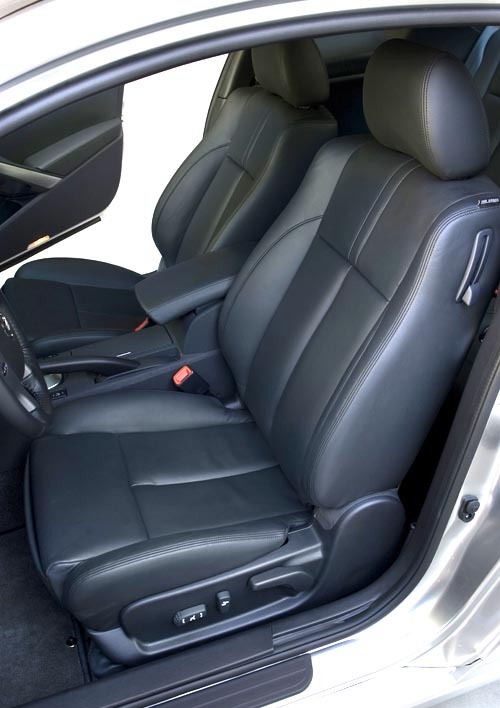 The coupe has a 4 inch shorter wheelbase than the sedan, and it appears it was removed in the rear seating area.Four adults could theoretically occupy the Altima Coupe for a jaunt, but the rear-seat passengers had better be shorter than 5′ 8″ or so. The dash is very Infiniti-influenced, with chrome accents around the dials and the red dials looked very sharp against the black interior.The interior storage space is large and accommodating, with a gaping glove box and a generous console opening.The push button ignition is a neat feature and works quite well although I’d prefer it be an option, since I still enjoy the tactile satisfaction of key in ignition.This model was well-equipped with the hands-free bluetooth, which accompanies the Premium Package and adds $3200 to the bottom line.However, that also gets you xenon headlights, leather upholstery, Bose sound and automatic climate control. On paper, this should be a ho-hum driving experience. A 183-inch-long, 3,290-pound car with a 67/33 weight distribution, rolling on woefully inadequate (and downright ugly) 215/55R17 Bridgestone Turanza tires should be a cure for insomnia. Despite all this, there’s a reason Nissan and Infiniti appeal to “enthusiasts”, while Toyota and Lexus appeal to “drivers”. The venerable 270hp VQ35DE engine delivers more than enough horsepower and may actually be too much for the average shopper – However, torque steer has been virtually engineered out, and this thing begs to be punched hard off the line – 258 pound-feet of torque at 4,400 rpm will do that for you.Borrowing heavily from the G35 Coupe, the instrumentation on the steering wheel is ergonomically logical, and falls easily to hand. The gauges on the dash are a complete improvement over the prior Altima, and in true Nissan fashion, they are large and easy to read. No need for fancy lettering or “racy” fonts – these gauges were designed for ease of use. The LCD screen is also well placed in the center of the gauge stack. The clutch is a bit “grabby”, and it seems Nissan has heard customer complaints about the noisy dual-mass flywheel, and taken notice. The shift lever is heavily sprung, and those new to Nissan may find themselves downshifting into 3rd instead of 5th (which, come to think of it, shouldn’t be much of a problem). The 6-speed is spaced nicely, and 6th gear is great for high-speed cruising, while still allowing enough torque for hammer-down passing at freeway speeds. This car loves to corner. Drivers of the new Coupe might find themselves taking the “long way home”, just to enjoy the surprisingly stable and neutral steering of this “gentleman’s cruiser” through the twisties. The nagging issue of a large blind spot created by the large, sail-shaped c-pillar will turn some drivers off. I’m used to it, since I drive a G Coupe, but it may draw complaints from older drivers or those switching over from a sedan. 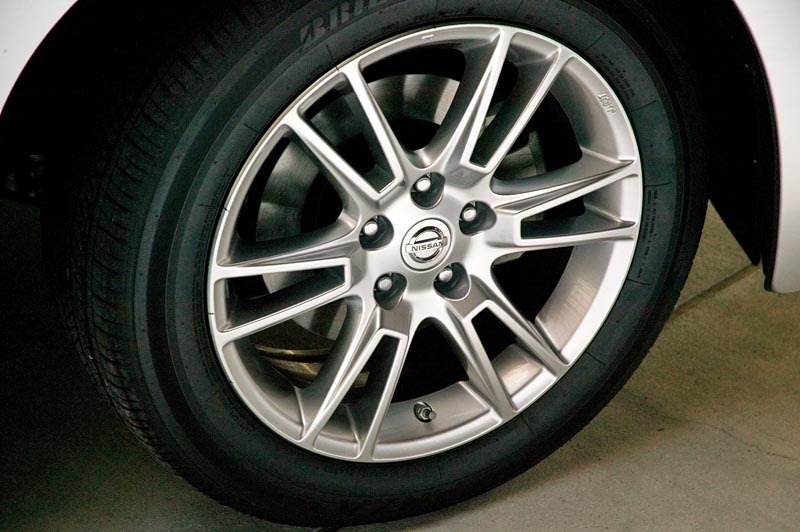 Despite the fact that Nissan stopped offering the huge Brembo brake package in 2004, you’d never know it from the inside. Stops were drama-free, with aggressive bite and firm pedal feel, even at the verge of ABS actuation. However, the tires are clearly the weak link, and if Nissan would pony up for some sticky (and wider) rubber, I’m betting they could shave a substantial amount off the Coupe’s 127-foot stop from 60 mph. Not wanting to shave 5000 miles off some unknowing Altima Coupe owner’s brake life, I left fade testing and panic stopping for another time. 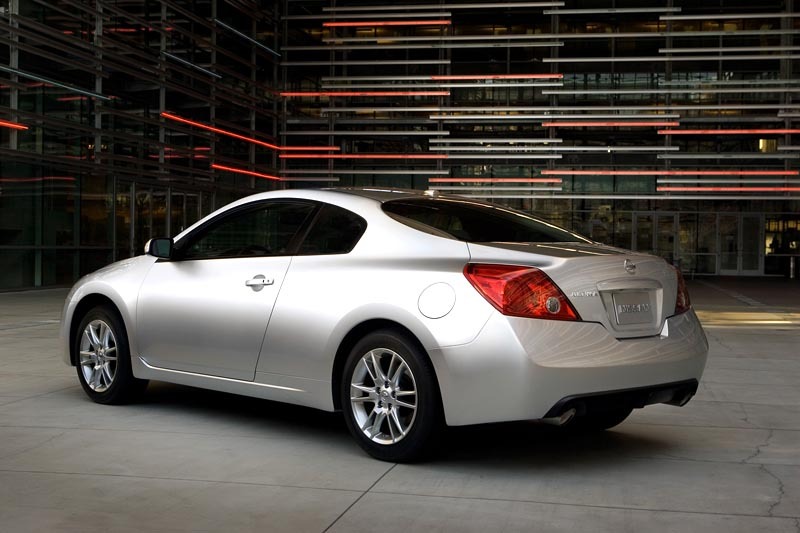 The Altima Coupe was designed as an answer to Toyota’s Solara, Honda’s Accord Coupe, and Pontiac’s G6, and it should steal a lot of sales. It’s faster than each of them through the 1/4-mile, and it outhandles each through the slalom, even with its miserable wheel and tire package. For those who want a Coupe but still need a lot of cargo space or want to constantly haul 2 or 3 additional people around, the Altima might not make the grade as your car of choice. If you are looking for a FWD sporty coupe as a fun commuter or daily driver, then the Altima Coupe hits the spot. Among the current offering of V6 front-drive coupes, the Altima Coupe 3.5 SE is easily the best choice on the market. Greg is a Nissan enthusiast and owner of NICOclub.